the velvet bird: It is Finished! My tattoo is finally finished!! I had gone in with the plans of getting a frame around this good old boy raccoon, but each time we tried out size after size of frame, it just wasn't working. No matter what way it was positioned, it just looked out of place, my arms just aren't big enough. Although this one arm doesn't feel that way right now, it's extremely swollen and makes me feel buff! This part of the tattoo (flowers touched up/background added onto) was horrible!!! 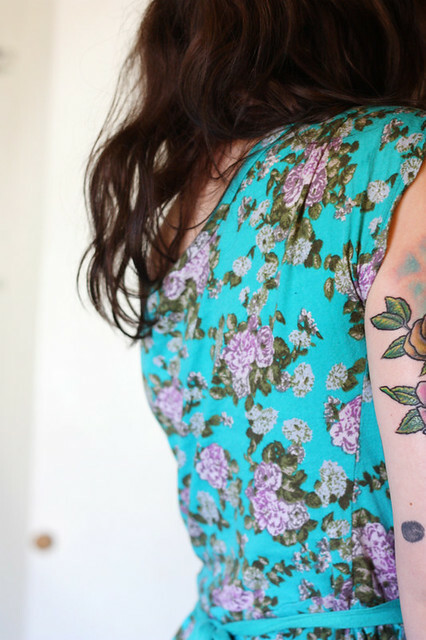 There are layers upon layers (x 10 in some spots) of colors which makes for a good looking tattoo but certainly not for a good experience, having to go over and over the same areas. Bleh. 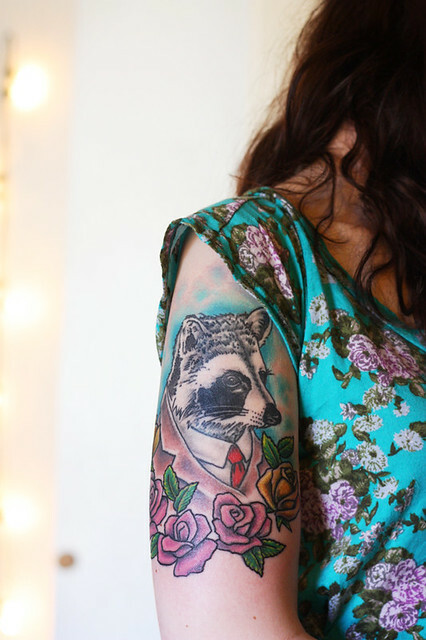 But like I stated in my first raccoon tattoo post, I am an idiot and keep putting myself through the pain. I would like to say a huge huge huge thank you to these lovely folks for creating such wonderful animals in suits, without which I would never have met George Cooney (that's what Patrick named him). It's so lovely! i have a print of this same Berkley piece on my wall...its the best! I hope you're very happy with it. 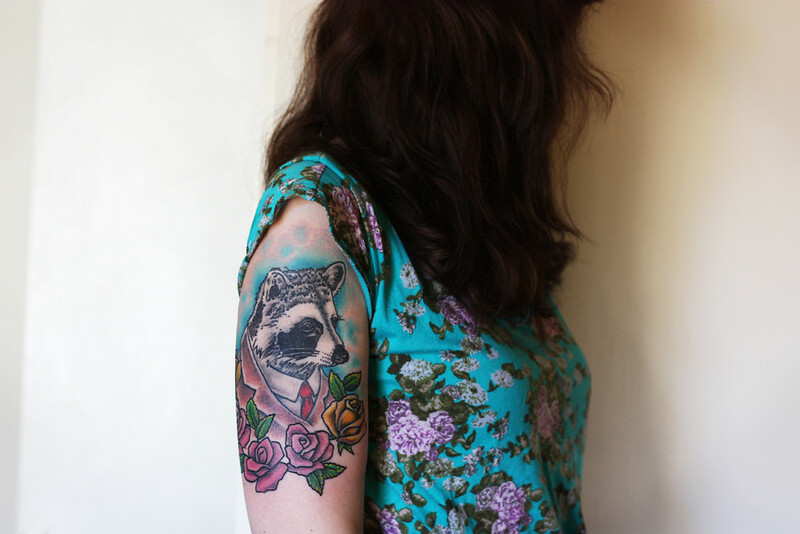 I love the color scheme-- your tattoo is incredible! I know it hurt (obviously), but how bad was it near the back of your arm? (above your elbow.) I've been contemplating going back and getting another for quite some time, but I'm hesitant to get it in that exact place. Ohhh wow! this is the best half sleeve I have seen I absolutely adore it. Oh my after going with my friend to watch hers get her done I can't even imagine the pain, totally worth it though! fabulous choice! the colors are just amazing. wow i love your tattoo. its so nice!! it looks wonderful! I love this tattoo. 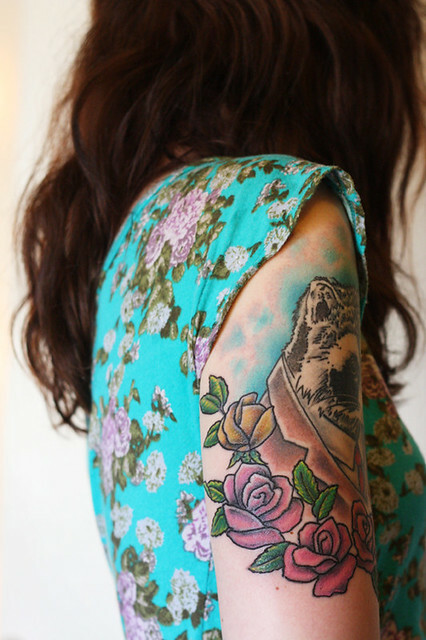 I think the size and location are just right and the pairing of this dress with the colours of the tattoo are amazing! I think that it was indeed worth the pain since I can't imagine it not turning heads daily and all the wonderful compliments you'll get! BEAUTIFUL! It's just gorgeous darling! Can't wait to show my husbie! Its a pretty. Hopefully the pain will go away soon. I love Berkley Illustration. I bought my friend the Cowboy T-Rex and the Shark in the Suit for her birthday last year. How adorable to get it tattoo'd! hey i'm james. i don't remember who i found you through, but i know it was because of your tattoos. i have six small ones and long for a big one and more. i just have a husband who disagrees with that idea. i live in northern michigan with my husband and daughter. i am a stay at home mom but long to be out in the world. i don't think i'm too crafty and i long to write but i'm working on that too. I got this print for my birthday last year,so so perfect!